Grade 4-8 biodiversity quiz. 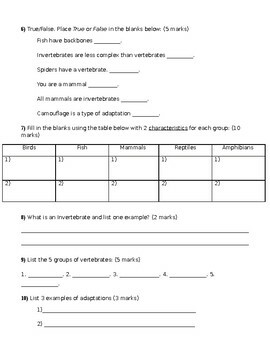 This will assess students on Vertebrates/invertebrates, classification, taxonomy, and animal groups/characteristics. This was created to satisfy grade 6 Ontario expectations, but can be used for different levels depending on the class. 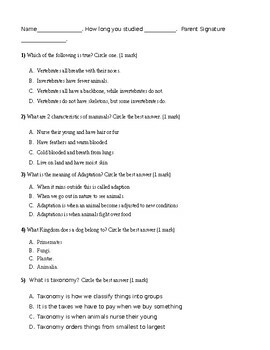 The quiz includes M/C, T/F, short answer, fill in the blanks tables. This quiz was created to be marked quickly and efficiently.